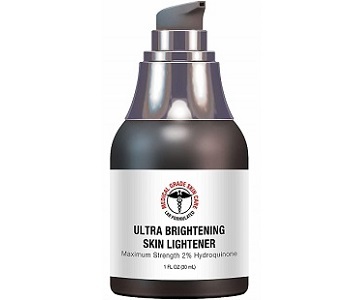 In this review, the skin lightening product Ultra Brightening Skin Lightener, manufactured by Medical Grade Skin Care will be examined. This skincare product is claimed to be a painless alternative to chemical peels for people who wish to remove dark spots while preventing hyperpigmentation and uneven skin tone. This product is said to impede melanin synthesis in the skin, fading away dark spots, liver spots, freckles, and sunspots, and evening out the skin tone. Keep reading this review to learn more about this skin lightening product. The ingredients used in this product’s formula enhance the health of the skin, while evening skin tone. For instance, it should be mentioned, the substance hydroquinone dwindles the visual appearance of marks in the skin, however, this element also helps to evens the skin tone. However, the manufacturer of this skin lightening fails to indicate which ingredients are active. The concentration of each ingredient is not given. Effective products should contain at least a 10% concentration of active ingredients, with a minimum of five patented, clinically proven ingredients. User instructions are clear, offering an easy-to-follow flowchart. The affected area should first be washed with warm water and dried. Two coats of the product should then be applied to the affected area, using the brush provided. The product should be allowed to dry in between coats. This process should be repeated twice a day for up to 12 weeks. This skin lightening product is available online directly from the manufacturer at $43.99; also on third-party sites such as Amazon. No discounts nor bulk selling offers are provided by the maker of this skin lightening product. Irrespective of our research efforts, we were unable to find a manufacturer guarantee of any kind. This is a concern: the product may not be as effective as the company claims it to be. However, the customer reviews are mostly positive. At first glance, the skincare product Ultra Brightening Skin Lightener seems a useful product for evening skin tone and removing dark spots and other spots such as liver spots. The product contains several ingredients known to be effective, and there are several positive reviews on this product. However, our research also found that there is no guarantee that protects the purchaser. If the product is not effective or results in side effects, the user is not allowed to return it for a refund, having to lose their money. Consumer are therefore at risk if they buy this product. In addition, the company that manufacturers this skincare product offers no package deals with discounts which could have saved money in the long run, while rewarding loyal clients. There are many other, similar skin lightening products on the market at present offering better quality ingredients, firm guarantees, and attractive package deals.